The average age was 38 years old, with an average tenure of 11 years in law enforcement. Forty-three of the officers were men, and three were women. Most of the officers (42) were killed by firearms, three were killed by vehicles (used as weapons), and one officer was killed with a knife. The average age was 40 years old, with an average tenure of 12 years in law enforcement. Forty-five were men, and two were women. The most common accidental deaths were automobile accidents (29), being struck by vehicles (six), or motorcycle/ATV accidents (five). To provide more timely data to the public, the FBI released portions of its annual LEOKA publication today, instead of in the fall as we have in past years. 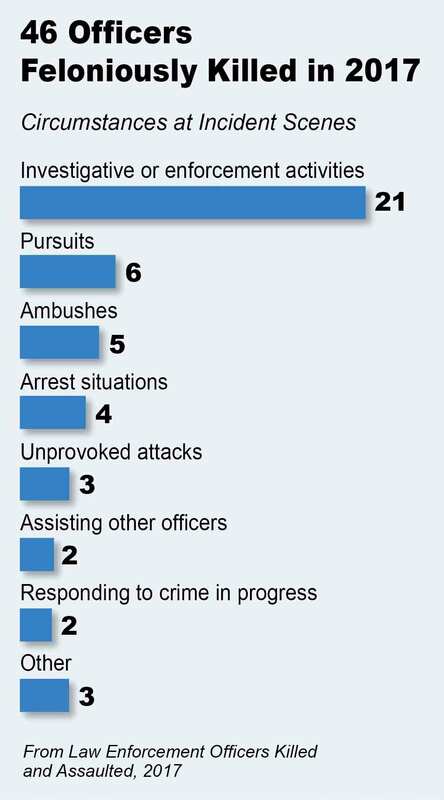 The remaining portions of the publication, featuring data on officer assaults in the line of duty for 2017, will be released later this year. As a result of a recent technical refresh, the database containing LEOKA information can process more data than ever before, which means the FBI can now share additional details about incidents in which law enforcement officers are killed and assaulted in the line of duty. A description of all the changes to this report can be found at Updates to Law Enforcement Officers Killed and Assaulted, 2017.